This post should really be titled I am too impatient not to post about my crafty project and too lazy to take a picture with my good camera. See previous post for details. 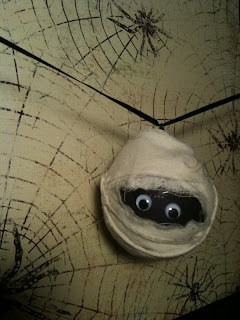 The mummy, but ornament style. I painted the ornament black, wrapped it in torn pieces of muslin that I secured with a little mod podge, and then used a hot glue gun to stick on the eyes. A ghost. This was used to hide an extra hideous paint job. 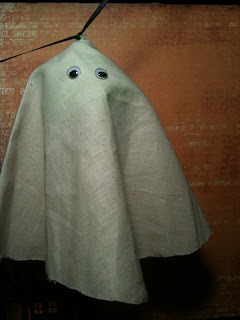 I cut a circle out of the muslin, cut a hole in the too to string the ribbon through, and hot glued the eyes. And this one was my favorite. For some reason the black paint worked really well. So I covered a couple of them with googley eyes and added them to the mix. I have them all strung together on black ribbon and plan to hang them as a garland as soon as I can figure out what my husband did with the staple gun. SOOOOO cute. And fun. I want a craft day! Can I come next time? PLEEEEEASE!!!!!!!!! Ok, it could be a little far, I just need to sit and do it... that would be fun! lOVE THEM ALL, but that purple one makes me want to have a HALLOWEEN tree to decorate! I actually like your mummie better, mummies wrappings aren't suppose to be stuck that hard.. SO I vote you as queen! Oh yes, the dollar store had them! And I decided on the project because Toots wanted ornaments too! I figured instead of fighting with her I would use them for a craft! cute and I love the lighting on the last picture. 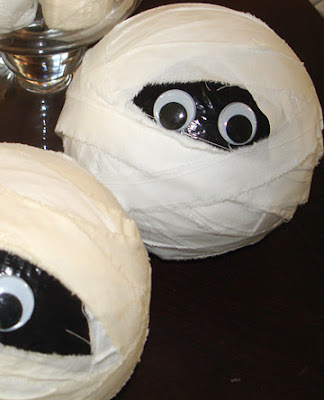 The mummies....TOO CUTE!!! Thanks for the great idea! Well your mistake turned out to be not such a mistake after all. The ornaments are too cute! It's nice to see something you've created after you show us all the great ideas all the time. Totally fabulous! 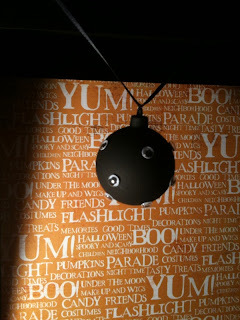 Such a great idea to use those Christmas ornament balls for Halloween!